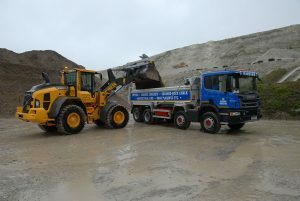 Robins of Herstmonceux, East Sussex has bought a new Volvo L90H loading shovel which joins existing Volvo L90s at its Newtimber chalk pit located at Pyecombe on the outskirts of Brighton. The 15.6 tonne loading shovel is powered by a Volvo six-litre Stage-IV engine developing 188 hp with a maximum torque achieved at just 1,400 rpm, resulting in low fuel consumption with maximum efficiency thereby achieved at a relatively low rpm. The machine also benefits from Volvo designed and manufactured driveline components designed to offer considerable fuel savings each shift. Fuel savings are further enhanced by the Volvo Eco-pedal, encouraging the operator to run the machine at its optimum rpm in the engine’s torque curve. Cap: Robins of Herstmonceux, East Sussex has bought a new Volvo L90H loading shovel for its chalk pit.